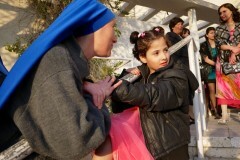 home / Multimedia / The Holy Land in news / “Taking care of the neediest – welcoming and training”: a .. In the midst of a very complex and difficult socio-political situation, that of the Gaza Strip, where people are suffering from lack of freedom in various areas, many children are experiencing traumas and behavioral problems arising from the situation of conflict in which they have grown up. These children are at risk of bearing for their entire life the scars of these situations, which have a very strong influence on their development and mental health. They have a need to develop within themselves the resources that will allow them to react in a positive manner to the adversities they have experienced, and continue to undergo, on a daily basis. To assist them in this sense, special techniques and intervention programs of “assisted resilience” have been developed which can be used in various traumatic contexts characterized by violence, conflicts and chronic instability, and where the timeliness and adequacy of the intervention is of high priority. In the Gaza Strip, in support of the Catholic Parish of the Holy Family and through the coordination of ATS pro Terra Sancta, the Italian nonprofit association “Francesco Realmonte” and the Catholic University of Milan, an intensive training course will be held in the coming weeks for teachers, educators, religious and others working with children who are victims of trauma. The course, which will last two weeks, will be held at the school of the Latin Parish, around which is gathered the small but vibrant Catholic community in Gaza, and will be conducted by two experts from the Masters degree program “Aid relationships in the context of vulnerability and national and international poverty” at the Catholic University of Milan. With this project, part of the larger and unfortunately continually necessary “Emergency Gaza”, through the training of educators we hope to help a large number of children to have faith in themselves and in their futures, and to learn to overcome their adversities.